When the popular LaxPower website shut down last offseason, MaxLax undertook a project to create our own mathematical formula to compare teams in order to give fans — and coaches and players — an additional method of comparing teams. 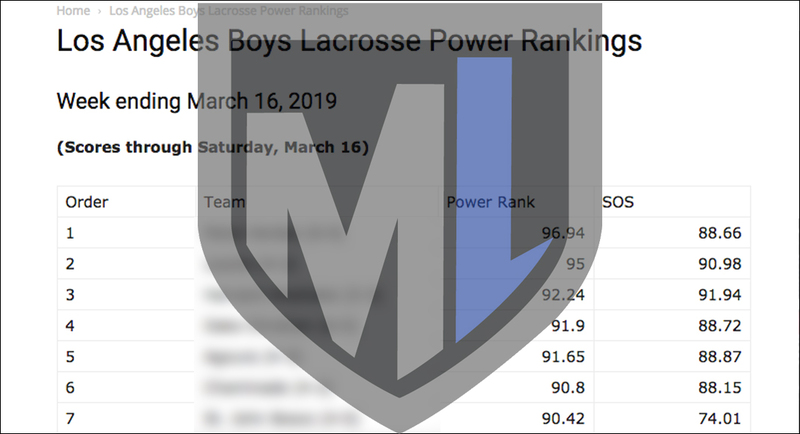 In the initial calculation, the MaxLax LA Boys Lacrosse Power Rankings look remarkably similar to the coaches poll Top 20 released Monday, with Palos Verdes and Loyola ranked No. 1 and No. 2. One team, though, is in a remarkably different place in the power ranking than in the coaches poll: St. John Bosco. The undefeated Braves (5-0) are ranked No. 12 in the coaches poll but No. 7 by the algorithm. Notable, though, is that the algorithm also rates Bosco’s schedule strength as the lowest among the first 32 teams in the mathematical ranking. Newbury Park, West Ranch, St. Francis and Peninsula are among the other teams ranked higher by the algorithm than by the coaches poll. Palisades, Crespi, Thousand Oaks and Village Christian are among the teams whose mathematical ranking is lower than their coaches poll rankings. The complete MaxLax LA Boys Lacrosse Power Rankings are available here, with a MaxLax subscription. Developed by Michael Traub (Aliso Niguel ’13, MIT ’17), the algorithm processes the final scores of completed games to calculate a rating based on each team’s goal differential in competitive games. The objective is to determine what each game outcome teaches us about a given team, then reflect that in a numerical rating. An expected blowout that actually ends as a blowout is non-competitive and teaches us nothing. An expected blowout that winds up being close, or competitive, teaches us something. For these reasons, the algorithm relies heavily on the concept of competitive games, defined as those in which the score was close or was expected to be close based on each team’s relative power rating. These games reveal a team’s true quality and have much more influence over the ratings than non-competitive games. To hedge against teams receiving credit for running up the score in non-competitive games, the algorithm also evaluates how much a particular game should influence the ratings by calculating a “competitive factor” (CF). Games with a high CF influence the power ratings more than a game with a low CF. Have questions or comments about the new feature? Contact us at [email protected]. Editor’s Note: MaxLax is a community- and subscription-supported website whose mission is to spotlight lacrosse, its teams and its players in Southern California. This post is available to the public, with no subscription required. If you follow lacrosse in SoCal and enjoy our coverage, please consider supporting MaxLax with a subscription. Just want to update the record for Culver City the team is 4-4. Wins against Notre Dame SO, Hamilton, Santa Monica and Patrick Henry (San Diego) Loss (Brentwood, Mira Costa, Redondo, and Mater Dei) We should have a higher ranking than Samo don’t you think? I appreciate the help. Please ask your coaches to submit scores to us. Even MaxPreps only shows CC as 3-4. Looks like they’re missing the Hamilton game. Complete and accurate scores are the only way the algorithm can calculate proper ratings and rankings. Thanks again for the help. How is Harvard Westlake Ranked higher than Oaks Christian?? Oaks beat them 8-7!? First, it’s a mathematical formula based on goal differential and schedule strength, so head to head is less important in evaluating a team’s strength than it would be in a coaches poll or playoff tie-breaker. Second, you’ll notice the algorithm believes HW has played a slightly tougher schedule (92 to 89) and is rated only about .35 points “stronger” than OC. Pretty even, and a one-goal difference in their head-to-head matchup pretty much bears that out.